Attorney General Jeff Sessions speaks to a group of local law enforcement representatives about the opioid epidemic and violent crime, Monday, Jan. 29, 2018, in Pittsburgh. 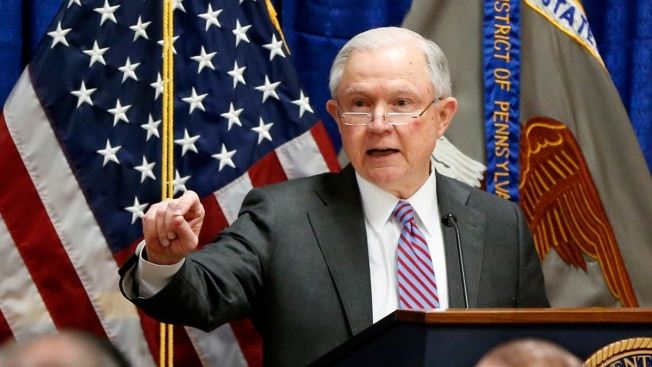 U.S. Attorney General Jeff Sessions is scheduled to make a “major sanctuary jurisdiction announcement” in Sacramento Wednesday, as tension continues to mount between the White House and California over the state's decision to stand by its sanctuary cities. The announcement will be made at a California Peace Officers' Association event on the 26th Annual Law Enforcement Legislative Day, according to his office. The event will start at 8:05 a.m. at Kimpton Sawyer Hotel. Dozens of undocumented immigrants have been arrested across Northern California last month, according to federal officials with Immigration and Customs Enforcement and Removal Operations. The arrests have sparked fear in immigrant neighborhoods and kept people at home for fear of being arrested, according to local business leaders. ICE arrests come amid a nationwide debate over whether local jurisdictions that call themselves “sanctuary cities” must cooperate with federal immigration authorities. About half of the individuals arrested have criminal convictions in addition to immigration violations, including convictions for assault/battery, crimes against children, weapons charges and DUI, he added. “Sanctuary jurisdictions like San Francisco and Oakland shield dangerous criminal aliens from federal law enforcement at the expense of public safety," said ICE Deputy Director Thomas D. Homan. "Because these jurisdictions prevent ICE from arresting criminal aliens in the secure confines of a jail, they also force ICE officers to make more arrests out in the community, which poses increased risks for law enforcement and the public." Both Schaaf and San Francisco Mayor Mark Farrell responded to the news of Sessions's scheduled appearance in Sacramento. Schaaf called Oakland a "city of immigrants." "We will continue to exercise our legal right to exist as a sanctuary city," Schaaf said. "We will continue to inform all residents about their constitutional rights, and we will continue to support California’s sanctuary status." “We will also distinguish between law abiding residents who work hard and contribute to our community from dangerous criminals," Schaaf added. “This administration has tried to portray all immigrants as villains. We know that is a racist lie, and we will shed light on that myth every day."